Boone, Contemporary Business, Second Canadian Edition, provides a comprehensive, current, and contemporary solution to your introduction to business needs. Though still covering the traditional areas of an introduction to business course, the text takes a contemporary approach using current real-life examples to engage university and college students. Our authors are experienced professors with first-hand knowledge of the resources needed to meet the needs of introductory business students. With a newly added continuing case featuring a Canadian company, Beau’s All Natural Brewing Company, new video cases, and video link updates per term, this text promises fresh, current materials for your introduction to business classes. Students will receive insights into the many facets of business that contribute to the dynamic, ever changing world of work. NEW video cases have been added to the Business Weekly Updates site. These cases will be updated every term and will include assessment questions, as well as open ended discussion questions. Instructors are encouraged to add comments and share ideas with their peers on this webpage. NEW Continuing Case featuring a Canadian company, Beau’s All Natural Brewing Company. Found in each part of the text. Includes a video component. NEW end of chapter video summaries. Updated opening vignettes and feature boxes. Additional cases featuring real companies. 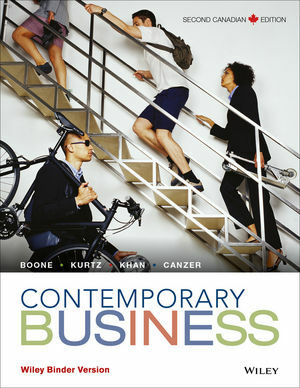 This edition of Boone, Contemporary Business now has WileyPLUS Learning Space with ORION available. Based on cognitive science, WileyPLUS with ORION provides students with a personal, adaptive learning experience so they can build their proficiency on topics and use their study time most effectively. WileyPLUS with ORION helps students learn by learning about them. WileyPLUS Learning Space is an easy way for students to learn, collaborate, and grow. With WileyPLUS Learning Space, students create a personalized study plan, assess progress along the way, and make deeper connections as they interact with the course material and each other. Through a combination of dynamic course materials and visual reports, this collaborative learning environment gives you and your students’ immediate insight into strengths and problem areas in order to act on what’s most important.